I promise I'll answer the 6 weeks of un-answered e-mails sometime soon! I swear! Some quick and easy blog material for a while. Daily totals of all bird species observed, to give you an idea of what it was like (plus some notes on the weather). Notes: Light NE winds, mostly sunny. Comments (written today): wow!!! 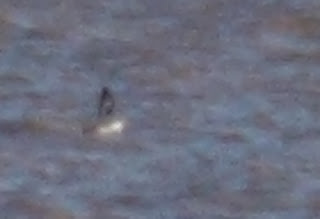 A Dovekie in the first hour of watching. What are the odds? And 2 Guillemots? 3 alcids of 2 species in the same day? The weather didn't seem great for a large movement, but little did we know, there was actually a good number of birds moving - considering! Notes: WARM!!! South winds. 10/12 degrees?! Built the waterbird shack out of driftwood. Comments (written today): Nothing like super warm temps and a lack of birds to keep you entertained. I spent most of the day in a t-shirt building our "fort" out of driftwood. Pictures will follow!!! 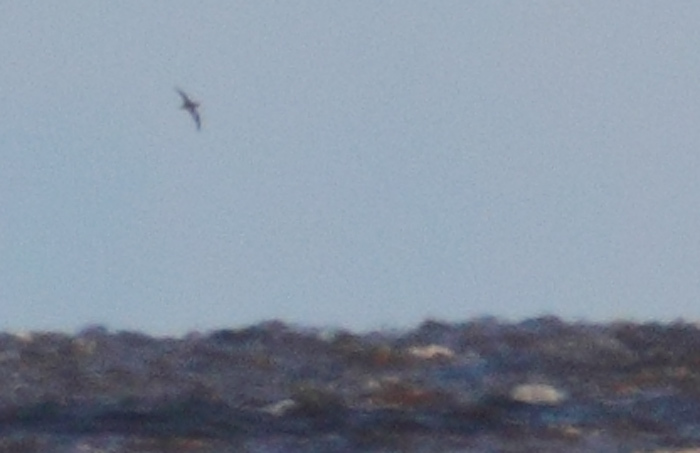 Lots of shorebirds and ring-billed gulls for James Bay in mid Nov! First Glaucous Gull on the trip, a nice adult. I think that the lack of Ice in Hudson Bay was the reason we never really had a good gull migration (plus wind direction problems. Comments (written today): really good looks at this days Dovekie. What an odd bird! It's funny how you can get a good bird like this on a fairly slow day. 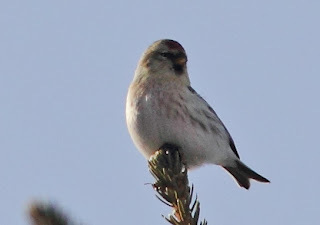 Most observations of Hoary Redpolls (106 total!) were of small flocks flying in from far offshore!!! Do they migrate over water intentionally? Or did they get lost out there at night? 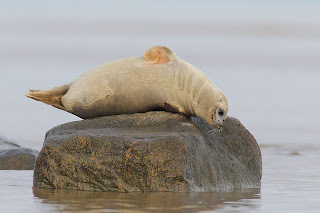 Now that I hopefully still have some peoples attention, I'm very curious to nail down some ID's on these seals! 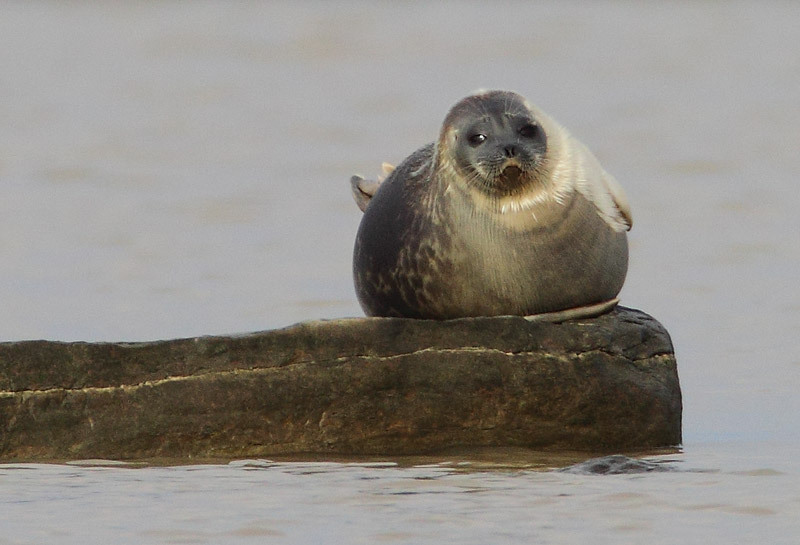 On Nov 15th, I managed to sneak out at low tide, and get some so-so shots of a younger Bearded Seal resting on a rock at low tide. Note the square flipper and "beard"! 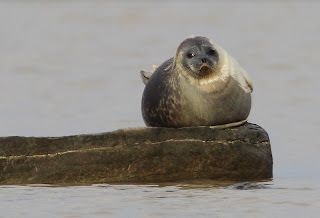 The black T on the head fades as the seal matures. (At least, I think that's what Bruce Mactavish told me in Newfoundland, where Bearded Seals were hard to come by). Then, November 16th struck with a flurry of seal-goodness. It was pretty obvious by mid morning that there was considerably more seals around than previous days. At low tide, Alan and I wandered out onto the mud, and tried to photograph several that had "come ashore" on rocks, near the mouth of a small creek. The strange part, none of this "wave" of seals were Bearded. 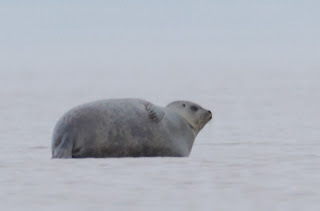 It was a very calm and still day, but a storm the next day sent most of the seals packing. So, what were they? SEAL ID 1: One of the larger "mystery" seals. Several had this dark stripe down the back. 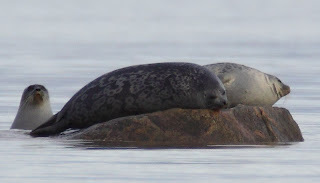 Seal ID 2... Two more of the "dark stripe" types. 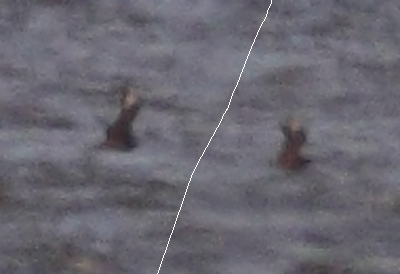 I think these are the same two seals, with a 3rd on the size. Different angle and light. Seal ID 3:. A young pup that allowed me to get very close. 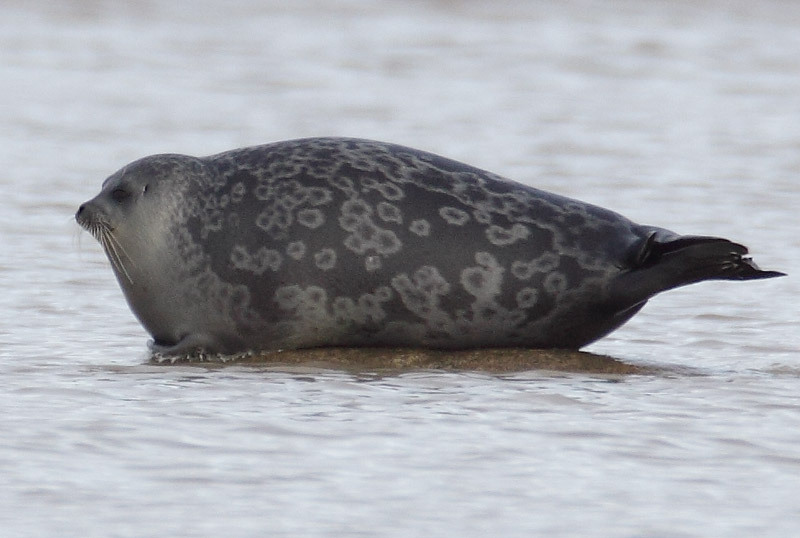 Seal ID 4. No idea what this fella is. 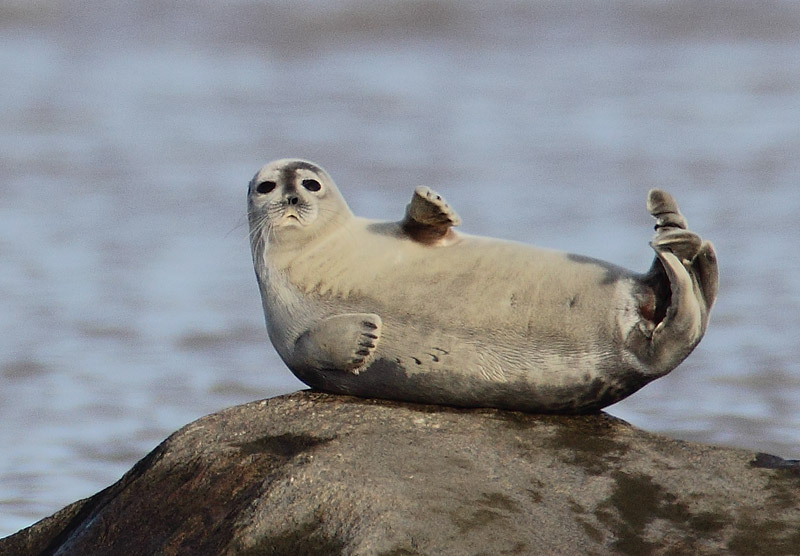 Seal ID 5:. 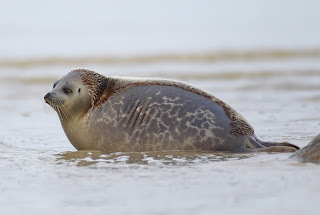 Same species as the pup (seal 3)? Funny lookin creature. An adult Ringed Seal??? 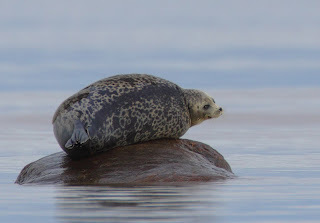 I still have no idea, but ringed seal would be a life-mammal for me! So there you have it! 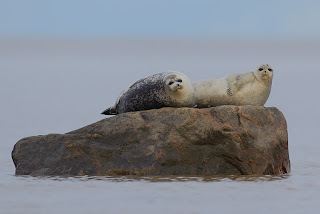 Seals in Ontario! At least 2, possibly 3 species here. (Harbor(?) Ringed(?) and Bearded!). Any ID help is very welcome. Comments can be emailed to me, or left below (you can even leave them anonymously if you want!). A few "line" shots, both shots show about a second of travel. And a look at the weather (bird is in there!). A fine collection of terrible bird photos, if I do say so myself! Over the next 7-10 days, I'll be adding detailed daily bird sightings from the trip, more bird photos, and more scenery style photos to show what the place looks like! Copied Ontbirds posting - Alan spent some extra time on it! Alan spent a little extra time on the details of Netitishi in our ontbirds posting, so I've copied it here - just in case some blog viewers don't follow ontbirds! Brandon R. Holden and myself have just returned from Netitishi Point on southern James Bay, where we were present on the dates of November 9 to 21 inclusive. November 17 -- 540 birds (record-high count for Ontario?) - I put down 555 for my count! -- NEW to Ontario, if accepted by the OBRC; we watched the bird for fully 2-3 minutes in excellent conditions in sunny weather as it zipped up and down over the waves at relatively good distance, seen when the winds were WNW and fairly stiff. Distant photos taken by Brandon. -- NEW to northern Ontario and Moosonee/Moose Factory Area if accepted by the OBRC. 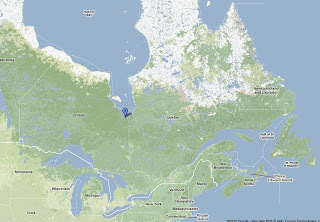 -- NEW to the Hudson Bay Lowlands of Ontario. -- An odd story surrounds this sighting. On the first night (10th) we were sitting around our campfire well after sunset when in the fading light we saw the clear outline of a thrush fly through the camp clearly about 100 feet away. We both said to each other "What the heck was that?" 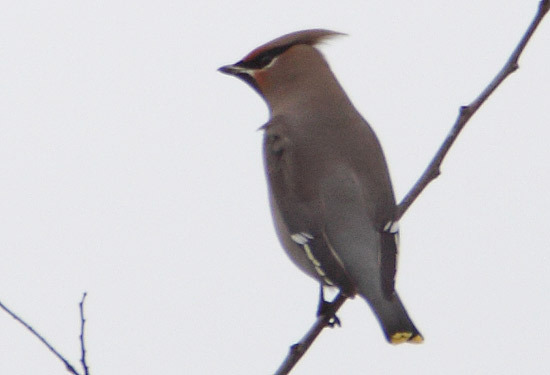 Especially since at this time of year virtually no migrant land birds are present. We both agreed that it looked slightly too small and slim for American Robin, and it didn't look right for something like a Hermit Thrush. I repeatedly suggested to Brandon that it might have been a Varied Thrush, and in fact I went on several hikes trying to relocate it. On the 14th Brandon flushed something beside the trail and heard what sounded like thrush calls. The following morning (15th) I was just leaving camp when a bird flushed from my feet and landed only 20 feet away -- a beautiful male Varied Thrush! We never saw it again. The bird looked feeble, so presumably it perished. Too numerous to detail here, but our perception re how late birds remain on James Bay continues to change with increased knowledge. On our last full day of observing on November 20, the following was still present -- 1200 Long-tailed Duck, 23 Black Scoter, 12 White-winged Scoter, 55 Red-breasted Merganser, 18 Glaucous Gull, etc. 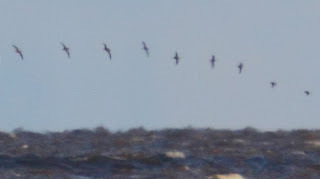 As late as November 17, 85 Sanderling and 10 Black-bellied Plover were still present! So when do waterbirds truly clear out of southern James Bay. At the moment, no one really knows! 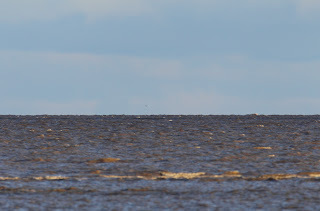 NETITISHI POINT is located in extreme southern James Bay about mid-way between the mouths of the Moose River and Harricanaw Rivers. The location has some unique features. First, it is slightly elevated thus the spruce forest comes right up to the shore of the bay. And due to the slight elevation, one is safe from any super high tides that may occur, which can be quite dangerous especially during fall storms. Also, the low tide mark is quite close to shore, so even at low tide one can still easily see the shoreline. NETITISHI POINT is a remarkable place, with majestic spruce (White I think) forest on ancient beach ridges, with the ground often covered with up to a foot of sphagnum moss. It is truly one of the great birding locations in Ontario. We were fortunate to be able to use a crude cabin that belongs to a Moose Factory Cree family, who use the site mostly for the spring good hunt. On a daily basis we watched the incoming tide, sometimes watching for 7 hours straight or more. It can be quite challenging with very cold temperatures and strong winds. Brandon took it upon himself to build a very elaborate shelter our of driftwood during the first 2 days, which was excellent for providing relief from the elements. WEATHER: It was quite balmy during our stay, and we only experienced a day or so of winds with a north component, which is probably the reason why we did not see any expected Northern Fulmars. Near the end of our stay the temperature plumaged to minus 19 celcius, which left a considerable amount of shore ice on the tidal flats, making observing anything of interest next to impossible. It was time to bale out and head back to Moosonee! A special thanks to Brandon for suggesting this trip. I hadn't been to Netitishi Point since 1981 -- before Brandon was born! DIRECTIONS (per OntBirds Co-ordinator requirements) -- From Toronto drive north 400 miles to Cochrane. Get on train to Moosonee, for 186 miles. At Moosonee take a taxi to the Airport. Get on helicopter. Take helicopter 21 due miles east to Netitishi Point. Land helicopter. You're there. Well Alan and I have emerged from the woods after 12ish days of seawatching. The short of it: we never really had the weather we were looking for, but we had some killer birds. 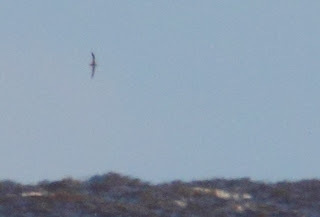 SOOTY SHEARWATER - new for Ontario!!! Varied Thrush - first record for the hudson bay lowlands? Looong story with this difficult bird. Black-legged Kittiwake - a review species in the north, 5 different birds on 2 days. Purple Sandpiper: seen 3 days I think.. Flock of 7 was the highest count. 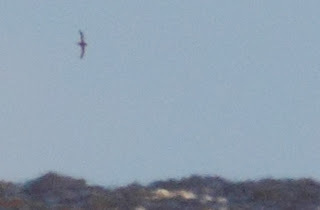 Killdeer: probable reverse migrant seen flying E on south winds. VERY late for up here. Those are my main highlights, but there were more. 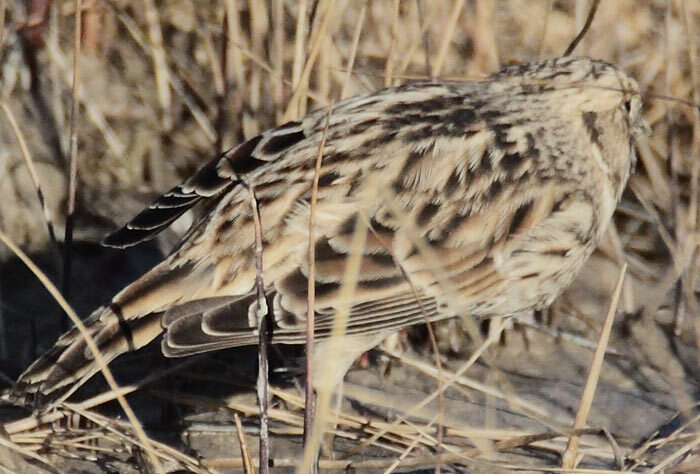 Finches were seen daily (daily flocks of Hoary Redpolls), shorebirds were VERY late (80+ sanderling in mid nov?!) plus a few high counts (550+ Red-throated Loons!). More will follow over the next few weeks as I enter the sightings online, sort photos, and get some sleep! Train to cochrane in 1 hour, then a very long drive home in the dark. Lots more to come!!! - marine forecast (either James Bay, or Southern James Bay).. Keep an eye out for north winds! That is what will bring us the birds. At the time of writing, they're calling for south winds for days after we arrive.. BOO!!!!! -- a place to keep an eye on the snow-cover and ice, as it heads towards James Bay. Hopefully near the end of our trip, a good chunk of Ice will have formed in James and Hudson Bay! 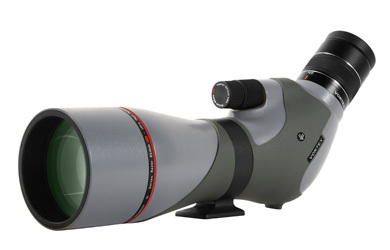 Might as well do 1 more plug of my Vortex Spotting Scope. Vortex was kind enough to lend me one of their Razor Spotting Scopes, and it`s a huge reason I was motivated to do this trip. I can absolutely say I can identify more birds with this scope than my previous scope! You can see close birds better, and see birds farther away. (Perfect for some James Bay seabirds). Have a look! Go to the dealers page to find a place where you can go check it out. And if you ever see me out in the field, please ask me about it and give it a try! Okay! Time to get rolling. Blog will return sometime in 2ish weeks! 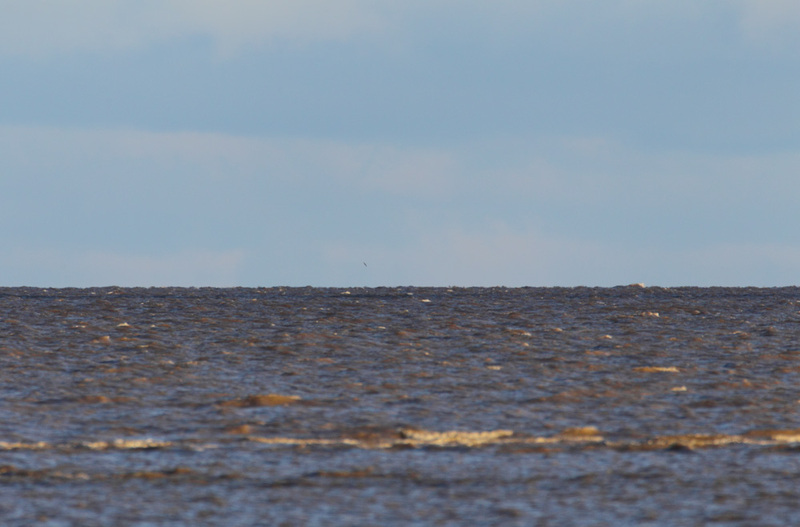 Alan Wormington and myself are leaving from Moosonee via Helicopter on Nov 9th to the coast at Netitishi point for ~2 weeks of seawatching. Alan and Doug McRae spent ~6 weeks out here in 1981 to some awesome results (rarities), and the time has come for an adventure. Heck, I spend days and days watching Lake Ontario at Fifty Point and Van Wagner's Beach - why not go to Ontario's "sea-coast" for some real fun?! 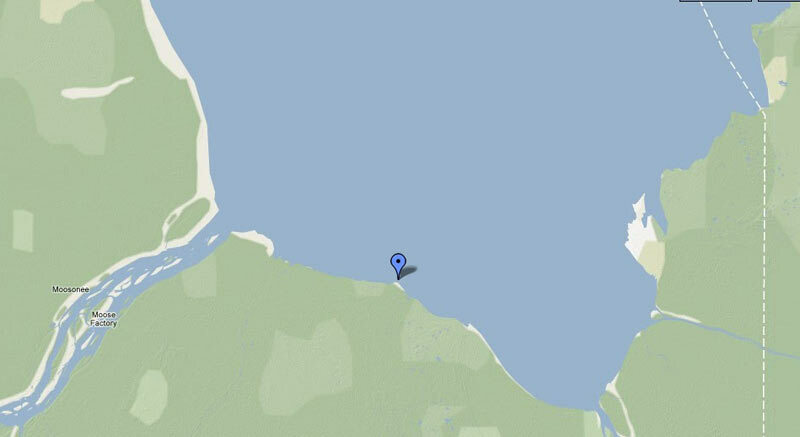 Closer look at where Netitishi is on the southern part of James Bay. Note the perfect location for wind with any northerly component! It's the gales of November that will bring us birds. Deep water also lies (reasonably) close to the north.. All and all, it's looking like a great place to be! I have high hopes of getting (at least) 5 new birds for my Ontario list. There's also a good (well, as good as it's going to get) chance of finding something new for Ontario, which is the tops - when you like finding birds like me! I'm not exactly ready to go, but I can't wait! Can you tell im excited? Hey! It's October 29th. -- the last day of our (Jenn and I) super-fantastic adventure in the north. --- We left Moose Factory early in the day, taking a water taxi back to Moosonee. We found a place to stash our packs (train station) and wandered off in search of the Sewage Lagoons and Landfill. At least the 3rd Landfill I've brought Jenn to... If you can't win a girl over at a landfill, there's no hope for you. In general, the sewage lagoons were really slow. 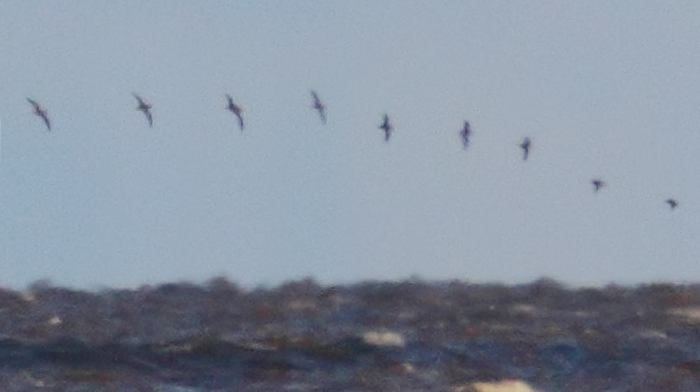 No shorebirds, limited ducks (scaup etc) plus a Rough-leg and a Red-tail. The landfill was quite fun. (I think Jenn would agree with that statement.. Right Jenn? Jenn?) Another Juv Thayer's Gull have pretty good views, along with a Juv. Great Black-backed Gull. 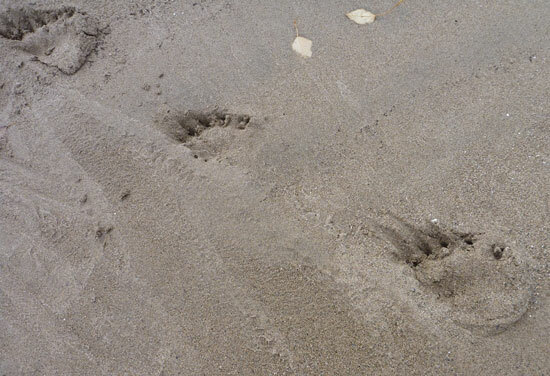 Lots of bear tracks around the dump, but no luck with seeing one. The ravens also put on a pretty good show. While walking down the road to the dump, a garbage spill had attracted a large group of Gray Jays, which provided us with some entertainment. The birds up there don't know that people=food. I remember spending some time in Thunder Bay a few years ago in a similar situation (I was throwing trail mix at birds, to no avail). Still lots of finches on the move, with crossbills and redpolls flying past, but no surprises! We boarded the train, which was moving at 5pm. We had about 2 hours of daylight to watch the telephone poles, which was fruitful. Considering the fact that we were watching from a train. Noteworthy was 4 Northern Hawk Owls and a single Great Gray Owl. The Great Gray was flushed by the train, somewhere close to the tracks, so we really only got to see it flying away. Not the best, but what can one do!? And that's all she (I?) wrote! A really fun adventure with my good-looking girl :) .. now all we have to do is go back sometime when everything is open in town! 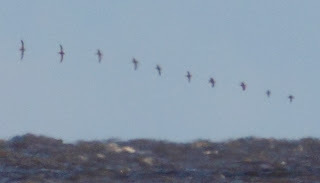 (And when there are 10000 more shorebirds to look at). At least we know more about what we're doing, for the future! (Best I can do for photos) Not exactly taken from the train. One major goal this winter: better raptor photos needed! Maybe i'll have some time to get my real website back online too! A little unexpected, and another new bird for my work list. Looks like another species to be watching for in southern Ontario. 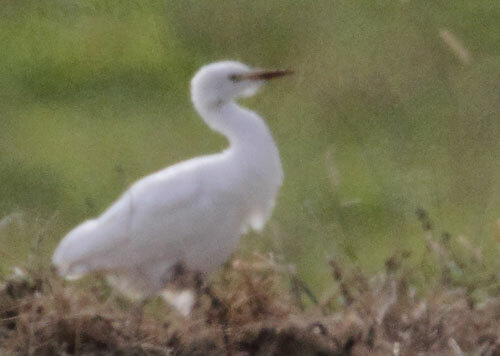 Maybe not as rare (overall) as something like a Cattle Egret, but it wasn't a bird I was expecting to see at all! Pretty fun. Another Cackling Goose. This one a pretty typical adult Richardson's. Not much more to add! Golden-crowned Sparrow in Michigan - not too far from ON. --- just a sample.. Lots of rare birds lurking out there to be found! You would think I could answer some of the dozens of un-answered emails, but this blogging really requires no effort or brain function at all... Honestly, I might be asleep right now. We booked a room at the eco-lodge in Moose Factory, which was a perfect chance to un-pack our things and spread them around the room to dry (what else are hotel rooms for?). We then headed out for a day on the town. --- Red-tailed Hawk was an adult, at the landfill itself. 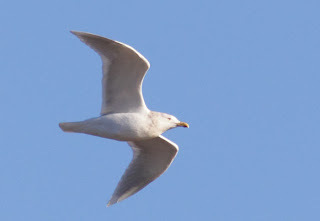 --- Thayer's Gull was a close-range juvenile bird that gave awesome views. Almost makes me wish my camera wasn't broken!!! --- Boreal Chickadees and Red-breasted Nuthatches were in large numbers around the island!!!! Black-backed Woodpecker flew over - rather poor views. 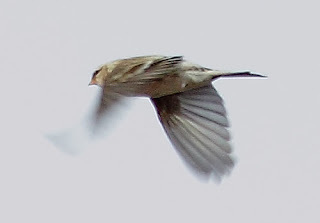 --- Snow Buntings everywhere! Much lower numbers of larks than Ship Sands, and no Longspurs in town. --- Large flocks of Redpolls seen around the island, but we had our best looks (by far) at flocks on the road to the dump as they fed on Birch. A gorgeous female Hoary Redpoll have us really good views. I wonder how many flew over us?! Come to think of it, the landfill and nearby road was pretty much the whole story! 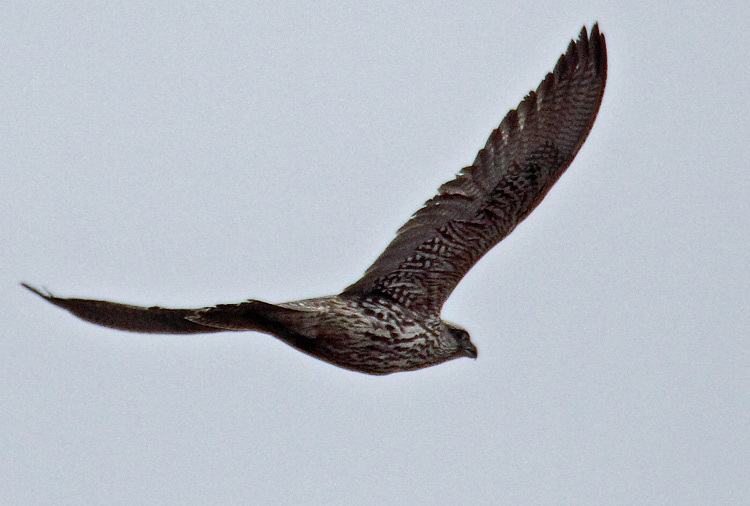 We had a Merlin fly over us in town - late? We bought some food at a nearby grocery store for dinner, and headed back to our hotel at mid afternoon. The cold front aspect of the storm started to move through, and strong (cool) west winds were blowing. Staying in the hotel room seemed like the thing to do, to end out day! Final Moosonee post tomorrow - back to the town itself! Everywhere in Moose Factory. Old photo though, stupid broken camera. Walking the cold streets of town, narry a Snow Bunting to entertain us. Hunger set in. Food. We needed food. A light in the distance: A pizza hut/gas station combo!!!!!!!! Middle birds are the same two Cackling. Midget on the right. So what the heck is going on here? 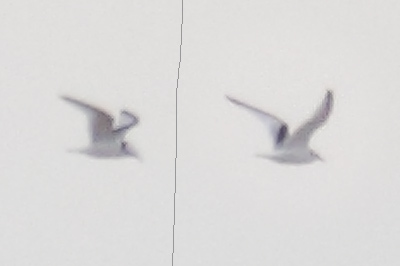 My best guess is the left bird (bottom photo - the small one) is a poorly-nourished Richardson's Cackler. 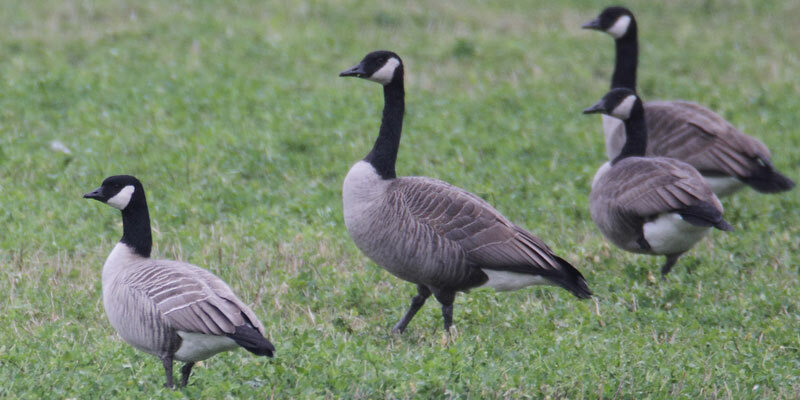 Apparently large goose colonies in the far north can seriously over-graze their breeding grounds, resulting in abnormally small birds growing up. This bird is an adult, but i'm guessing the smaller developmental is permanent? We were dropped off at Tidewater on Tuesday evening after ship sands. With Jenn's superb camping skills, we got camp set up and ready with at least 45 minutes to spare before total blackness and heavy rains began. I was quite pleased with the fire I eventually got going as well - a good chance to warm up a bit after we frolicked in the waves an hour earlier. - With the inland cyclone causing havoc south of us, we had the first passing front throughout the night. Heavy rains and very strong winds rocked around us, but we were quite happy inside the tent, even getting some good sleep. The front hit at a very poor time for vagrants, just after dark. Too late for diurnal birds, and too early for nocturnals... What can one do? Wednesday brought an end to some rain in the morning. We enjoyed some oatmeal, and set out to explore the island during the day. We had a ton of fun, but i'm guessing you really only care about the birds! There were no real surprises, but some more great looks at boreal species. The White-winged Crossbills but on a great show, giving great looks as they came down to a pond for water/baths (just as we were getting water of our own). The 2 Pipits were the only ones we had for the whole trip! As we headed to bed on Wednesday night, the rain once again fell (at a poor time for birds), and we slept (quite dry) through most of it. Another parting photo and story. I had planned to write about Moose Factory today as well, but I'm getting overly tired. Tomorrow! --- Yes those are Bear tracks! Big ones too. We camped on a pretty small island, 2 nights sleeping in the tent, but never actually saw our Island friend. Lots of fresh tracks in the sand though! And some fresh droppings on our way to get water on Wednesday. C - c - c - cacklers! Blake A. Mann said... Good birds! 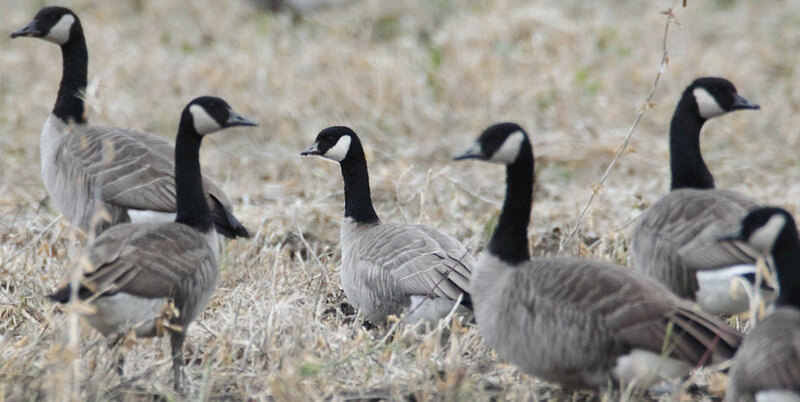 Cackling Goose again? We don't get many of them in CK it seems! --- I think I might have a Cackling Goose magnet somewhere in my birding gear! Unfortunately it seems to drive other rare species of Geese away. I have a considerably harder time getting Snow Goose! One I really enjoy following! 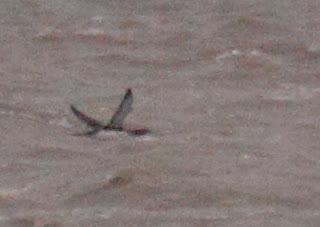 Some awesome Cave Swallow photos on there recently. Which leads me to my next bird-thought of the day. My lack of Cave Swallows today! This photo was taken today! In Ontario! I found at least 250 Tree Swallows today, but not a single unusual species with them. I know i'm not on Lake Erie, but one would think I could have been a bit luckier! Not even a late Barn Swallow!? More Moosonee goodness to follow! 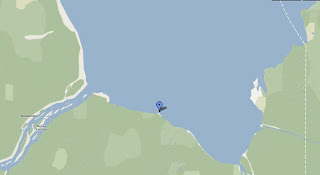 Moosonee Day 3 - Ship Sands Island!!!! !